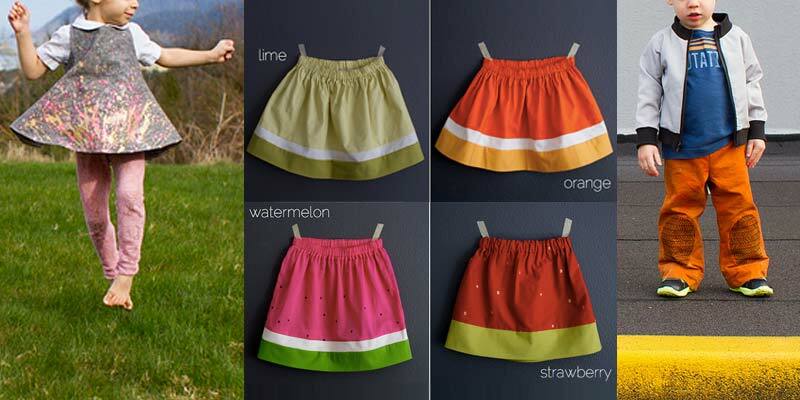 I have a sneaking suspicion that Kristin of Skirt As Top is superhuman from a far flung and little-known planet where overachievers are secretly bred with sewing powers. At the very least she had to have been class president or something similar. Kristin exudes charisma and has an acumen for coming up with brilliant collaborations. She is a driving force behind Film Petit (Napoleon Dynamite is the most recent feature. Hilarious!) and Vintage May, two of the coolest sewing series around. On top of her supreme prowess in all things sewing-related, she’s whip smart and is the friendliest gal, quick to show warm and encouraging support for newbie and veteran bloggers. Oh, she also has terrific decor chops. Hello! 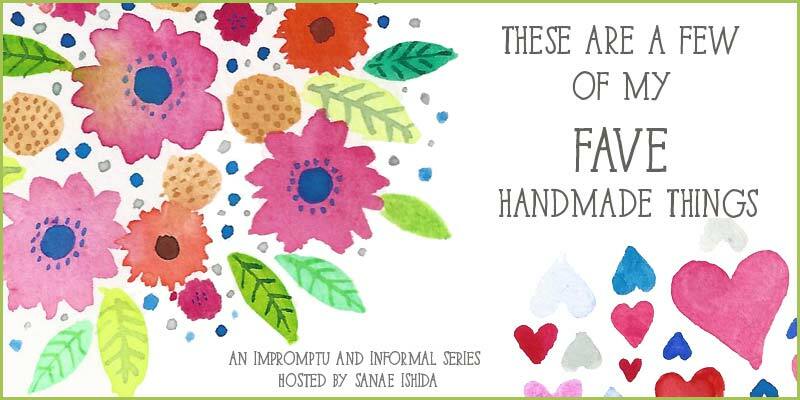 While Sanae is off enjoying some sunshine, I’m here sharing a few of my favorite handmade things with you. And honestly, this was a super hard topic! I like different things for different reasons, and my favorites tend to change on a regular basis. So I decided to try to pick my daughter’s favorite thing I’ve made, my son’s favorite, and my favorite. 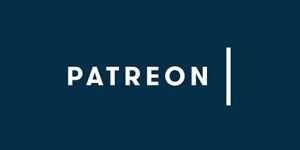 My husband’s favorite is as-yet unblogged! It’s actually his Father’s Day gift, and I haven’t gotten a chance to get photos of it yet because he’s using it too much. 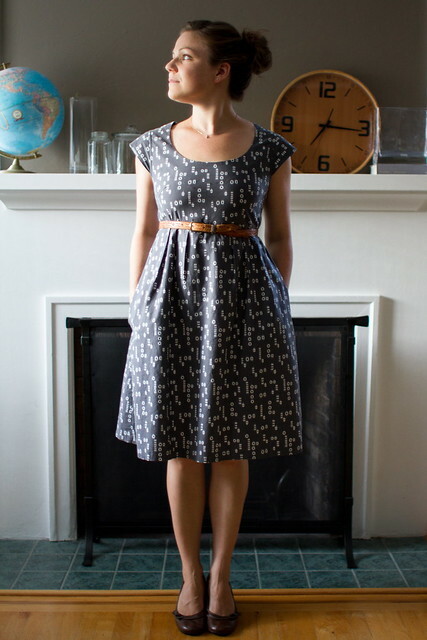 I made this little dress for her as my “signature look” Project Run & Play Season 3 in Winter 2012 (I was a contestant). 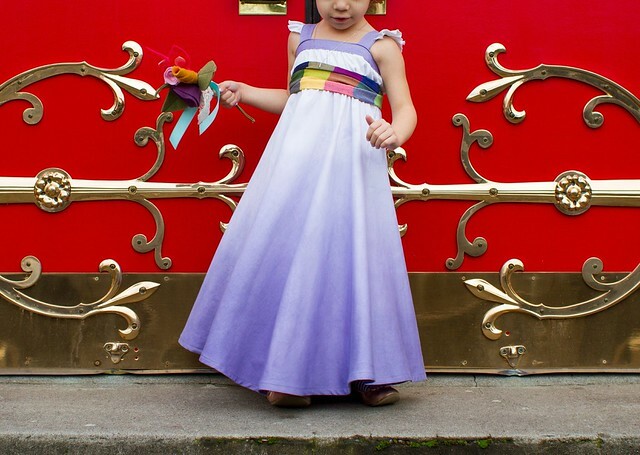 It’s self-designed, with a maxi-circle skirt which I dip-dyed purple for an ombre effect. The fabric is an old (super soft) bedsheet. I made it “just for fun” because I had been voted out of the competition the week prior, but wanted to finish all 6 looks without spending amy more money on fabric. 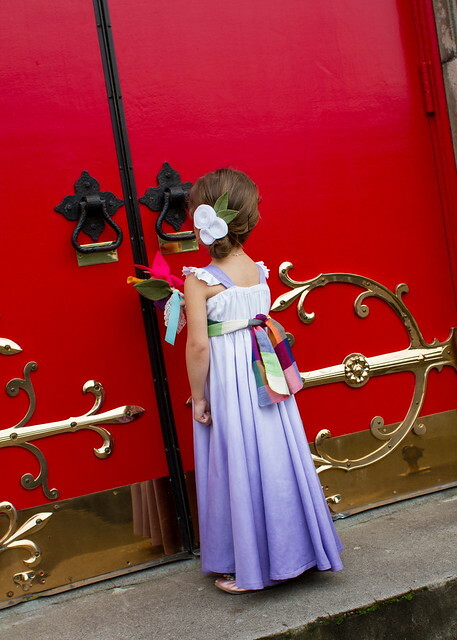 My daughter didn’t wear it very much back when I made it, but last summer she suddenly decided she wanted to wear her “wedding dress” constantly, and she’s been wearing it ever since – out in public, for dress up, to bed, to climb trees. When one of those tree climbing incidents resulted in her ripping the skirt, she hounded me relentlessly until I fixed it. The purple is now faded and it’s about 3 or 4 inches shorter on her, but it’s still her most favorite. I made this little outfit as a part of an ongoing series my friend Jessica and I host together, called film petit, where we sew mini-versions of our favorite movies. A few months back, we chose Ferris Bueller’s Day Off and I sewed the look of Ferris’ best friend, Cameron – my post is here. 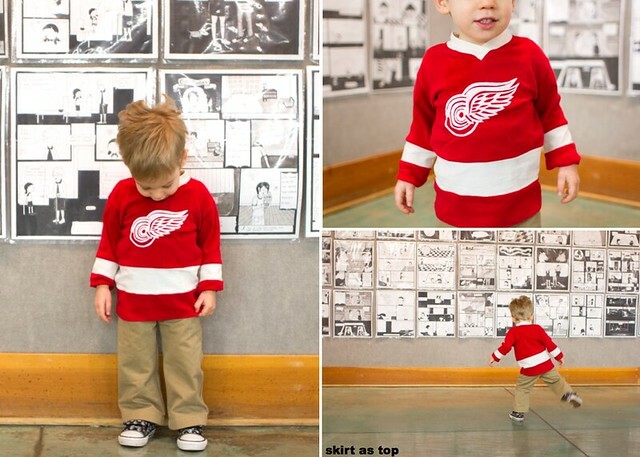 Part of Cameron’s look is a Detroit Red Wings jersey. The pattern is the Vintage V-neck by Blank Slate, and I pieced in contrast white stripes. The logo is a hand-cut freezer paper stencil. Though I think recently-completed Washi Three might actually be my favorite self-sewn garment to date aesthetically, Washi Two (shown above) holds a special place in my heart because it’s my first sewn-for-me garment that I choose to wear ALL the time and never feel like I’m walking around in something “homemade” looking. It just makes me happy when I wear it. It’s comfortable, flattering, casual but still able to be dressed up for a date. 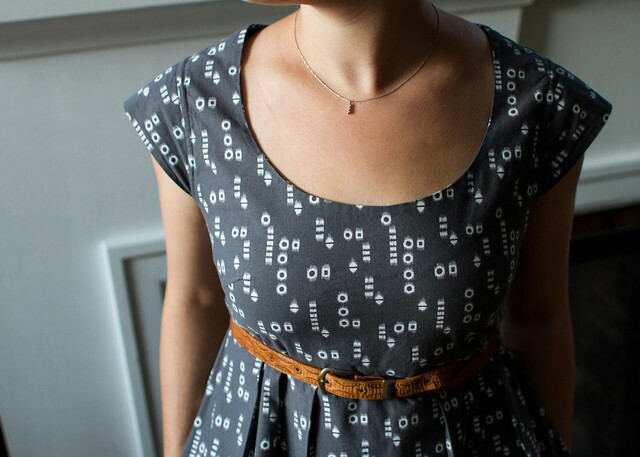 It’s the first self-sewn garment where I bought fabric for it that wasn’t sale bin/cheap stuff, because I knew that Rae’s Washi Dress Pattern would work well on me. 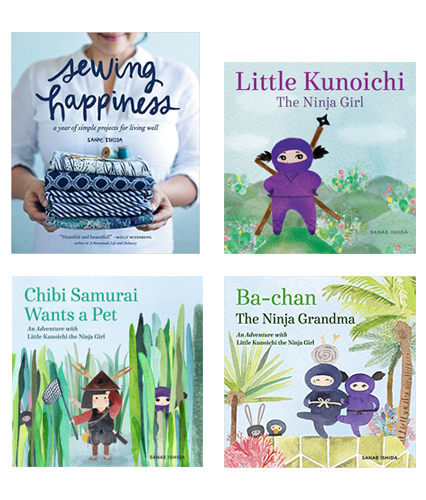 It gave me confidence and caused me to love sewing for myself – I now see it as a fun new adventure. I hope you’ll come visit me at skirt as top sometime! Thanks so much for having me, Sanae! I agree with Sanae’s comments about your super sewing powers, Kristin! You are amazing. 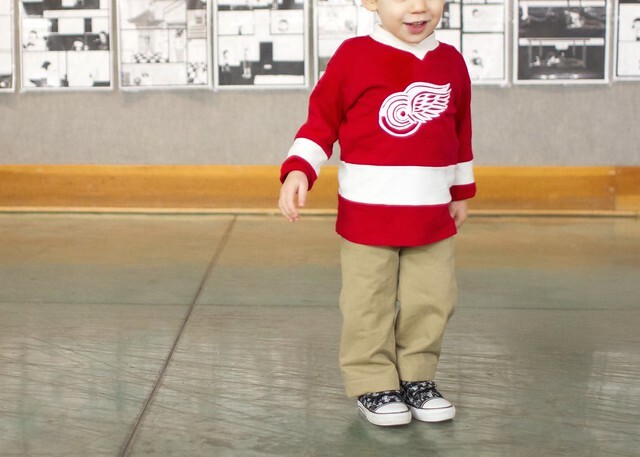 Love your round-up of the kid’s favorites, and being from Michigan am glad to see a little Red Wings love:) That Washi is gorgeous – I can clearly see why it’s a favorite! Kristin is fierce. Pretty much in love with anything she makes! sanae, i love your description of kristin – it’s perfect!! she’s totally a superhuman sewing sensation! The Pollock-inspired tunic is so lovely! and it was very interesting to read all the process involved in make it. I had a look to your blog and really you are very talented! I’m a super fan of you Super Kristin! Sanae’s intro is right. And it’s not blog-bull either- she really is a hero. Come to think of it, why don’t we all hate her? Oh yeah, because of the super-encouraging part. Mwah! I love everything Kristin makes! She’s so creative – never just “here’s the pattern I used, and this is the name of the fabric” – Kristin always adds her own touch to her creations!